As you can see by the cover, this is the 17th book in a series, though it is the first one that I have read. It is a bit uncommon these days to find a book or a series that is akin to serial pulp fiction. Think back on the days (if you are old enough [as I am]) to Doc Savage, The Executioner, Perry Rhodan, or even the more juvenile-targeted Mike Mars, or Tom Swift. This appears to be a book series that harkens back to these classic pulp adventure days. Hawk Hunter was a World War III hero who vanished on an extra-terrestrial mission a decade earlier. He now returns to his very damaged America with an equally damaged memory. The noted Area 51 holds the key and Hawk must fight his way there and along the way he’ll remember more and more about alternate universes and his actions among many of them. Fortunately, Hawk has an uncanny ability to maneuver in any ship that can fly, and he’ll need that ability to survive. This is just pure, adventure fun. This is the sort of book you read to take a break from the insightful, meaningful literature you might normally read. It is not intended to make a lasting impression, but rather be a bridge from one book to another. It is the snack food – the Kit-Kat Bar – of books. And in this role it does a fine job. I was suitably entertained. It made me miss the old Doc Savage books I read as a teen and I thought it did a nice job of staying current in the sci-fi/adventure worlds. I would be very willing to venture into this Wingman world again when I have an afternoon where I am looking for something to read. Looking for a good book? 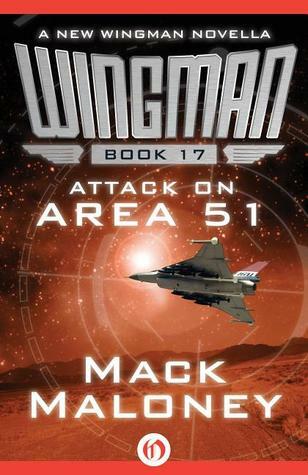 Attack on Area 51 by Mack Maloney is a Wingman novella that moves along very swiftly, won’t hold any lasting impressions on the reader, but will satisfy the craving for some quick adventure.